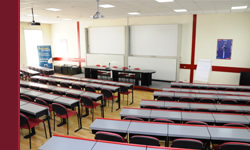 WUT Business School offers a variety of rooms and facilities of different size to organize different events, from small meetings to conferences and seminars. 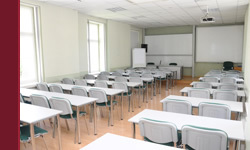 The School is located in the very heart of the business, cultural and tourist centre of Warsaw at the intersection of Koszykowa and Krzywickiego streets. The distance from the main railway station (Warszawa Centralna) and the Palace of Culture is approx. 800 metres. The airport, which is located some 6 km away, can be approached within 20 minutes. The prices quoted above are net. 23% VAT should be added. In justified cases prices can be negotiated. Rent of a multimedia projector (246 PLN, VAT inclusive - up to 4 hours). Food and beverages ("Cafe Bizneska" offers coffee, lunches, hot and cold starters). Free of charge parking for organizers - prior notice about the number of cars. Cloakroom on request (11 PLN, VAT inclusive) per hour. After 5.00 pm and on days free of work an additional fee for administrative staff is charged (30 PLN per hour, VAT inclusive).